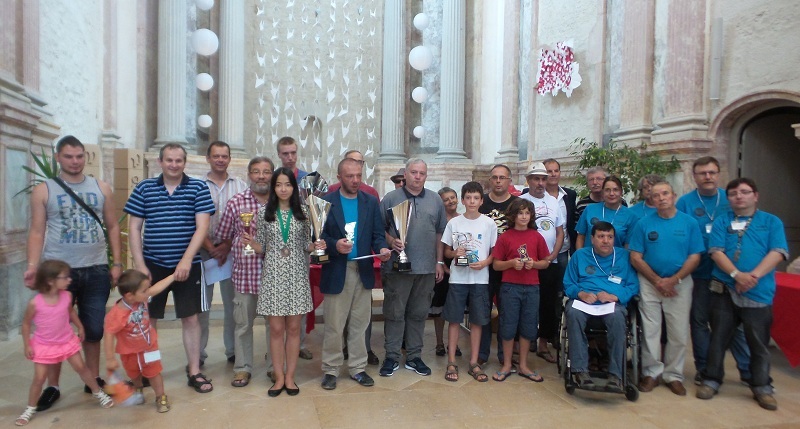 International Draughts Federation IDF – FMJD Section-64 in accordance with the Calendar of the competitions in 2015 holds from August 8 (arrival day) till August 15, 2015 (departure day) in Baume-les-Dames (France) 5th Stage of World Cup 2015 in draughts-64 – International competition “France-2015”. 5th Stage of World Cup ended. 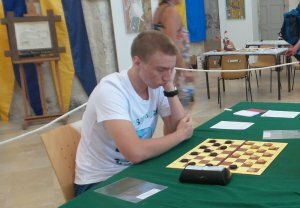 Grandmaster Dmitrii Melnikov from Russia won. 5th Stage of World Cup 2015 ended. Dmitry Melnikov won all the games in the finals and finished the 1st. Gennady Shapiro took second place after losing in the last match Dmitry Melnikov. Persistent struggle was for the 3rd place. Ekaterina Ivanova and Frank Laurent played draw in main micro-match. The fate of the third place was decided in additional blitz. Ekaterina Ivanova won and took 3rd place. At the closing of the competition, all participants received prizes provided by the city administration. The mayor presented the awards. The prize fund amounted to 1,000 euros. After closing all the participants have tried draughts cake, specially made for this event. Blitz in Russian Draughts was held today. Dmitry Melnikov from Russia won. 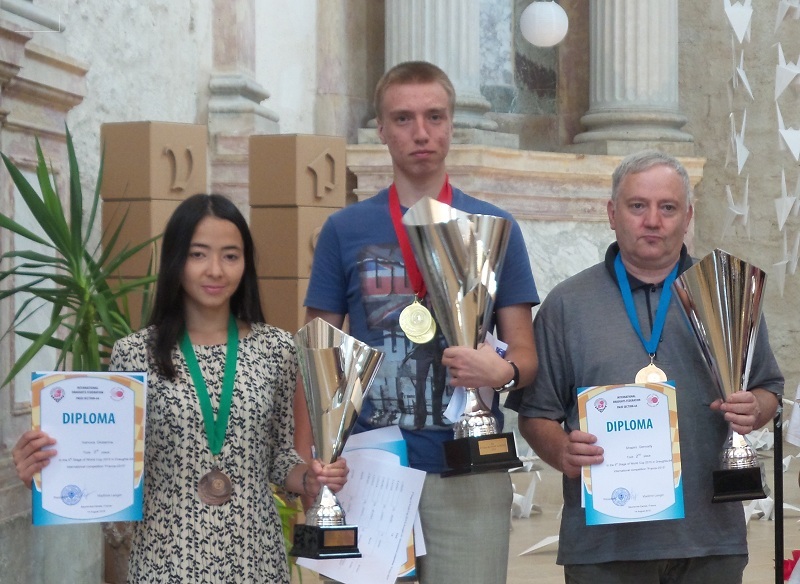 Gennady Shapiro from Germany took 2nd place and Krzysztof Juszczak from Poland took 3rd place. First stage of the classic program ended today. Next, the players will be divided into 2 subgroups of 8 players which in 1/4 finals, 1/2 finals and finals will determinate places 1 to 8 and 9 to 16. Blitz 144 was held today. 10 players participated. The tournament was held on the Swiss system of 5 rounds. Ekaterina Ivanova surprisingly won the blitz with a score of 9 points out of 10. Franck Laurent took 2nd place and Jacky Hannachi took 3rd place. 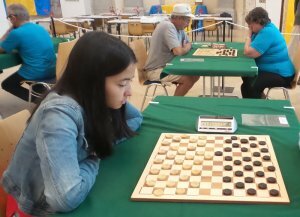 5 th Stage of World Cup 2015 in draughts-64 – International competition “France-2015” started today in Baume-les-Dames, France. 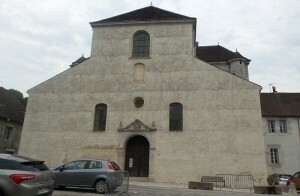 Competitions are held in the Abbey of Baume-les-Dames. 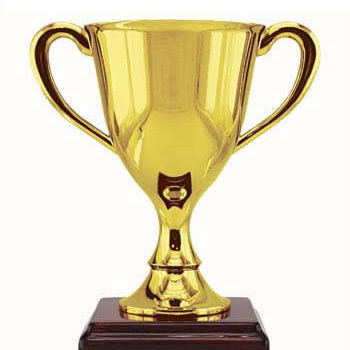 Organizers have prepared well for the tournament: Excellent playing hall, memory attributes for all participants of the tournament, the trophies for winners, commemorative awards to all participants of the tournament and more. Classic program began today. 16 players from France, Germany, Poland and Russia participated. Favorites of the tournament are International Grandmaster Gennady Shapiro from Germany and Russian grandmaster Dmitry Melnikov. Strongest French players will compete with them. Competitions are held in Baume-les-Dames (France) from August 8 (arrival day) till August 15, 2015 (departure day). 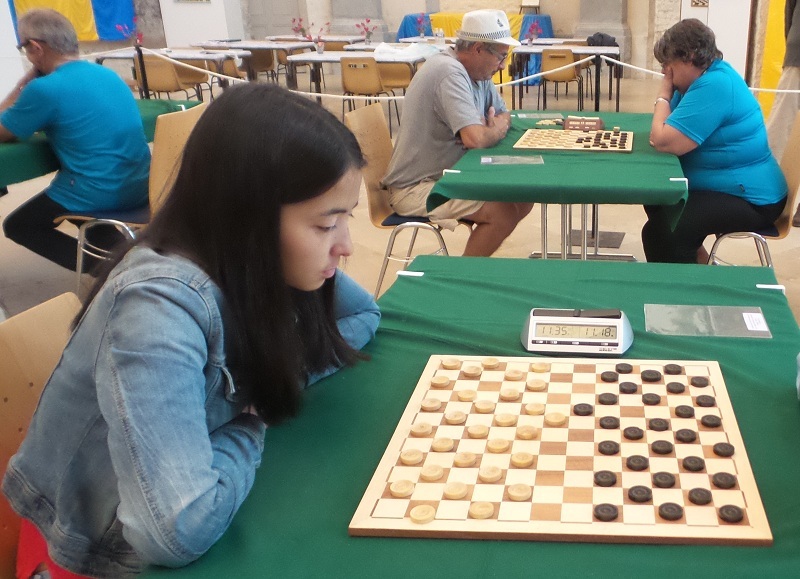 As part of the competition French Federation of Draughts 64-144 holds blitz in Draughts-144, 10min + 2s/move. The hotel is located 5 minutes from the game room. The price is € 45 for a double room. The costs of accommodation, meals and travel of participants are paid by their sending organizations or at their own expenses. It is possible to arrive from Basel, Switzerland. You need to contact with the organizers for other possibilities. 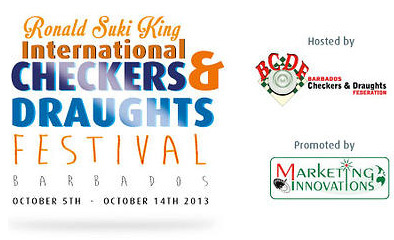 Applications for participation in competition must be submitted to the office of IDF – FMJD Section-64 on e-mail: [email protected] and to French Federation of Draughts 64-144 on e-mail: Franck Laurent [email protected] not later than July 01, 2015.